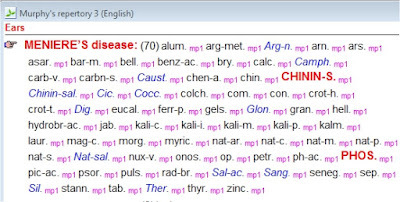 Meniere's disease is the distension of the endolymphatic system of the ( inner Ear) characterized by attacks of vertigo,fluctuating deafness and tinnitus.It is considered as the commonest cause of otogenic vertigo (vertigo due to ear diseases). It is now accepted as a failure of the mechanism regulating the production and absorption of endolymph. Although a precise cause of hydrops cannot be established in most cases. The classic syndrome consists of episodic vertigo, with discrete vertigo spells lasting 20 minutes to several hours in association with fluctuating low-frequency sensori-neural hearing loss, tinnitus (usually low-tone and "blowing" in quality), and a sensation of aural pressure. These symptoms in the absence of hearing fluctuations suggests migraine-associated dizziness. Symptoms wax and wane as the endolymphatic pressure rises and falls. Inotolerance to carbohydrate diet or diabetes may be present.Deafness is usually sensori-neural type.Audiometry shows the sensori-neural deafness,more so in the lower frequency. But mostly diagnosed by the syptomatology. 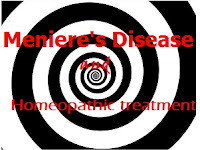 Now what is the role of homeopathic medicine in Meniere's disease. From my experience homeopathy has cured many patients compared to any other system of medicine.Homeopathy offers a good number of remedies for the situation.Homeopathic medicine along with proper diet.Primary treatment involves a low salt diet and low fluid intake. Diuretics are the main drug of choice for the modern medicine practitioners which fails to cure many. From my experience restricting the salt intake makes the patient feel well and is cured in a short period of time. 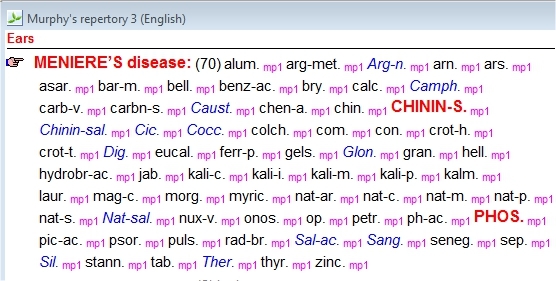 The main medicines include CHIN-S; PHOS, THERIDION,SILICEA, CAUSTICUM etc. The complete symptomatology has to be taken in to consideration before prescribing. Homeopathy can produce wonders in these form of disease when the patient is so desperate for recovery and when other system fails to give relief or cure the patient.